In every classroom, we teach many students including those less comfortable sharing in a group setting. When we have whole group or even small group discussions, how do we plan for those introverts who aren’t so comfortable in those conversations? How do we give those students a loud voice when we know they have one? Often technology can provide the perfect outlet for our true introverts. It can give them a voice and a place to participate loudly in our classrooms. Here are a few of my favorite tools for such conversations. Today’s Meet: this provides a Twitter-like back channel for students. The teacher quickly and effortlessly sets up the “room.” Students get into the room (no login required) by following the link, typing in their name, and answering the question provided by the teacher. OR the teacher uses it as a parking lot space for questions throughout the class. Either way, quieter students find their voice. Spiral.ac: this has several functions but one is a wall where teachers can create a question (one on each wall) and students can answer the question. In this space, teachers can send the answer back to a particular student if he/she has not answered it completely or needs more detail. The teacher can organize several walls so that throughout a class period, the teacher could move from one to another as the teaching continues. This way the conversation or reflection moves from space to space. Padlet: similar to Spiral.ac in the wall function except it only has one wall per URL. Although in padlet, students can not only have conversations, but they can also upload videos, pictures, and documents to the wall to then share with one another. Great conversations! So, if your students aren’t 13 and you’re not using individual social media accounts, these are some good ways to get them talking to one another throughout a class period or across classes. See what you think! I started this blog post about three years ago, addressing the idea that we often do what we’ve always done without reflecting on the WHY. We tend to go about our daily business and not stop to consider what if? What if we changed the schedule? What if we got rid of this furniture? What if we got to the root of why students misbehave rather than giving them consequences to change behavior? What if school was relevant to life? What if the school schedules were changed so that subjects were no longer taught in isolation? Think real world. I’m not just talking elementary kindergarten, either. We know that we need connections for learning to stick. By making connections across content, students learn in a way that is relevant and authentic. Learning feels meaningful and has connections to the world. Project-based learning is one powerful way this might be done. What if we took the time to understand our students deeply?As educators we often operate in a reactionary way. A student does something we don’t agree with: check or consequence. It happens again –> more severe consequence. And so the story goes. On a given day, the same students receive consequences over and over. What does this tell us? Are those consequences effective? We walk by a primary classroom with that dreaded stoplight or card system. By the end of the first month of school, what have those students learned? Often a tracked system where the red kids are quickly labeled, and they themselves find it difficult to change who they are after September. I have often had students tell me, “I am red.” What an awful thing for a five-year-old to believe. Why is he given the label? Because he is excited about school and can’t contain that excitement? By taking time to get to the root of students’ issues, we can properly handle them. Now, we also must be sure that there are even issues there. Excitement and wanting to stand…. not issues for a five-year-old child! If I am rebuilding school, my school is engaging. So that busy little 5-year-old from the above example. He won’t be sitting in a desk. There won’t be desks for him to sit in. Before being hired, every staff member will follow the path of a students all day in a traditional school, so that never becomes our school. Our kids will learn through projects and singing and dancing and authentic learning. They will be outside learning. Recess will be recess. Several times a day. Not moderated by adults. It will involve problem solving by students. Until we consider ideas we haven’t before, can we really take our education to the next step? Going through the National Board process early on in my career certainly helped shape me as an educator. Additionally it had provided me with opportunities I would not have otherwise have: I have spoken with district and state superintendents, local politicians, and one of the highlights was speaking before members of Congress on Capitol Hill. But our career is not made up of highlights but of day-to-days…..how we impact students, educators, and the field overall: that is what will make a career. For me going through the process solidified my reflective nature. I have renewed also and that process gave me the opportunity to reflect on the professional learning I had gone through and how that learning actually impacted my practice. I took months to reflect on the training that I had completed and determine how worthwhile they were; what impact they actually had. As a result, I am particular about how I spend my time. Particular about the professional learning I take part in. Particular about the degree programs I choose. I am currently the Innovation & Technology Coach at a middle school. I oversee the professional learning at the school as well as coach teachers as we move our school to one that is project-based learning and 1:1 iPads. I work hard to use that same high standard to create personalized professional learning for my teachers and staff that I want for myself. I am reflective after each PL session that I plan and ask for feedback to better it for the future. The National Board process is one that allows us time for reflection. Reflection to become better teacher. Reflection to become better coaches. Reflection to become better educators. Student Engagement….Has it Changed over the Years? As a young teacher right out of college, I knew I was going to change the world. I was an inner-city teacher and nothing was going to stop me–even if it meant closing my door sometimes to do what was right for my students. I remember one time having a conversation with my principal and telling her that I could use the textbooks (that were two plus reading levels above my students), or I could use trade books and other resources that I had that were written at their level. I assured her she wouldn’t regret it –confident on the outside but a bit nervous on the inside. After all these were second graders who for the most part didn’t know primer words. Innovative strategies were definitely what it was going to take to be successful. Technology wasn’t the same back then; however, student engagement was just as important then as it is today. That was and is the heart of a lesson. 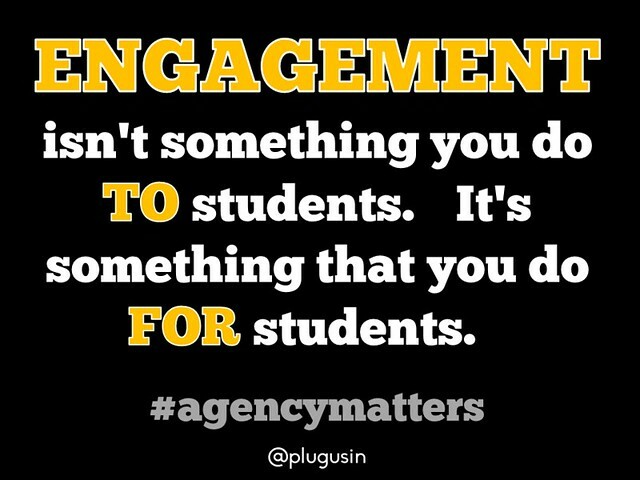 Without engaging our students we have nothing. Meeting these second graders where they were, making class fun for them, and being innovative in the process….that’s what it took to bring those students to where they needed to be. Today we have so many tools at our fingertips. By collaborating and using these to the best of our ability, we can reach our students….every one of them. Sometimes it means throwing one thing out the window to try the next and figure our what it is that is going to engage them and get them to a place where they are excited by school and learning. Most importantly, though, at the center of our classrooms are the students..and whatever it takes to engage them.